A stranger asking you for your empty beer bottle? Someone digging the garbage bin in public space? A bottle standing next to a garbage bin? All these are signs of a bottle fairy (“Pfandsammler” in German, the direct translation would be “deposit collector”). Bottle fairies are a small industrial sector that has evolved from what was originally meant to bribe Germans to recycle – and from the fact that some people are so poor that it’s worth collecting cents. Still, many people consider these deposit bottles more garbage than money and throw them away. Some cents are not worth the effort of going to a store to bring the bottle back, especially when you are drunk and on your way to the next nightclub. But what is unwanted garbage for some is money for others. As a bottle fairy, you need to know. A lot. Is this a deposit bottle? What value has it? When is the best time and where is the most promising place to collect? Where to bring the bottles back? You better be the early bird, because competition is growing. Sounds like a full-time job and it certainly is. And as Moser, a German sociologist, shows in his empirical study, this is more valuable than the little extra-money. You have to get up and leave the house for earning money – a purpose that resembles ordinary labour. The short moment of being part of a society that has turned a blind eye to you. Bottle fairies have become a common and visible part of German inner cities. 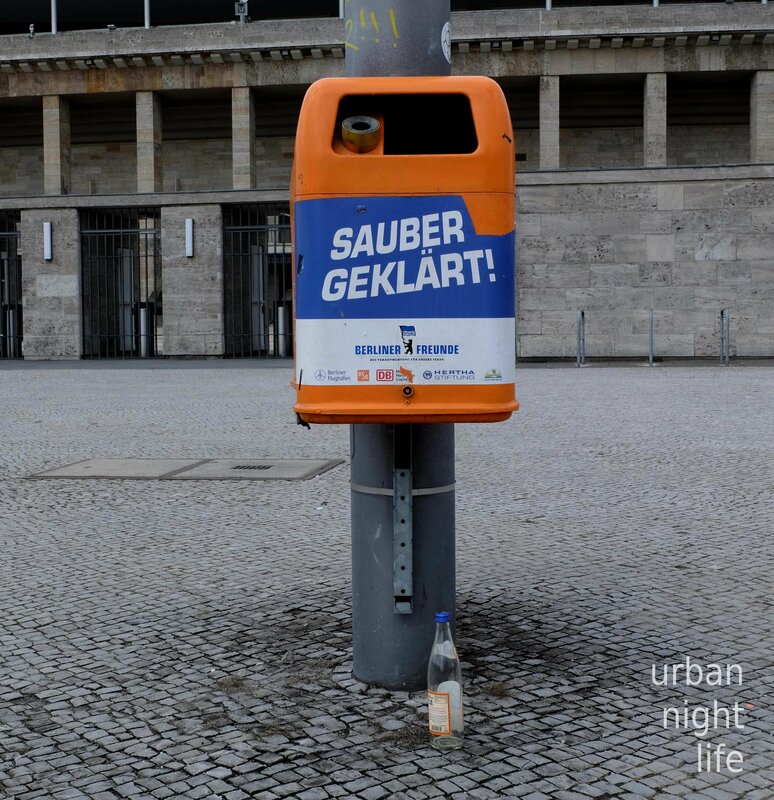 “Pfand gehört daneben” (“deposit belongs next to it [the garbage bin]”), a campaign of private offspring tries to rise awareness of bottle fairies by encouraging people to leave an empty bottle next to a garbage bin instead of throwing it in. If people have to collect bottles for living, please spare them the humiliation and risks of digging in a garbage bin at least. Meanwhile, many leave their bottles on top of or next to a garbage bin, depending on the shape of the latter. Bamberg decided to attach design award-winning rings on two garbage bins to make the bottle fairies job less humiliating. 1000 Euros each. Then again, Hamburg thinks bottle fairies trouble a clean and fancy image and has installed new garbage bins that make it impossible to dig in. 5000 Euros each. But no matter if you are team bottle fairy or not – wouldn’t it be more promising to spend this money and effort on bottle fairies instead of the shape of garbage bins? This entry was tagged alcohol consumption, garbage, protagonists of the night, public space. Bookmark the permalink.